Add homemade dumplings with stuffing mix to your pork stew for a savory dish. 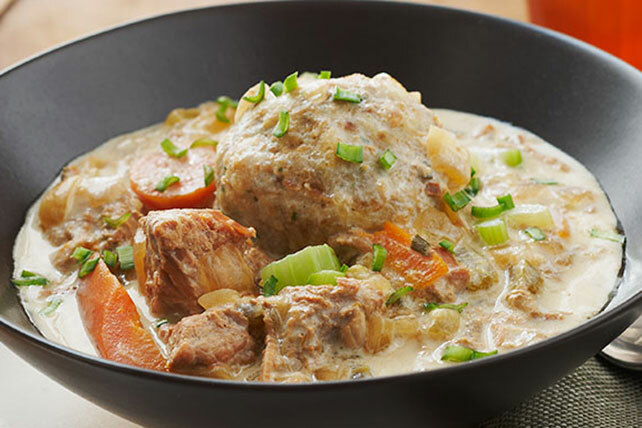 Our Slow-Cooked Pork Stew with Dumplings is perfect for a cold night. Combine first 6 ingredients in slow cooker; cover with lid. Cook on LOW 8 to 10 hours (or on HIGH 4 hours). Discard bay leaves. Mix eggs, stuffing mix and water; shape into 8 balls. Add cream cheese spread to slow cooker; stir until melted. Gently stir in stuffing balls; cook, covered, on HIGH 30 min. Turn off slow cooker. Let stand 15 min. Serve stew and dumplings topped with chives. Taking the lid off your slow cooker for even just a minute reduces the heat and extends the cooking time. Lift the lid only if instructed to do so in the recipe. Slow cookers come in a variety of sizes and shapes. For best results, use an oval 5-qt. slow cooker when preparing this recipe so the dumplings have room to expand, resulting in fluffier dumplings. Prepare using a boneless pork shoulder. Use moistened hands to shape the stuffing mixture into balls to help prevent it from sticking to your hands.